I was expecting displeasure with this recipe, and sure enough, I got it. I'm not a fan of chocolate that isn't sweet: bittersweet, semisweet, dark, etc. The ingredients for this chocolate ganache filling were simple: melted bittersweet chocolate and half-and-half. No added sugar, no vanilla extract, nothing. 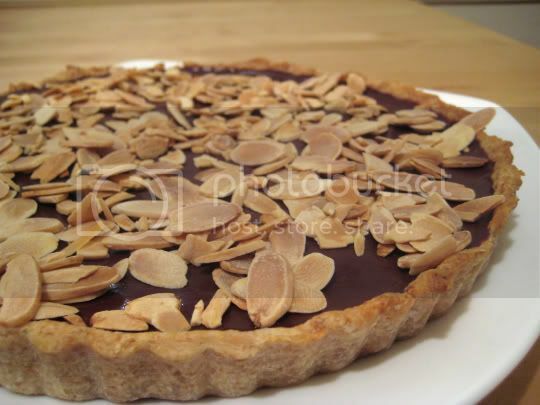 The recipe is even a bit misleading, calling for 1/2 cup sliced almonds in the ingredient list (assuming they are to be added into the chocolate, yet the recipe doesn't mention this anywhere). In the end, I just added them all on top (what a waste of almonds). Alas, the whole-wheat tart crust was even a bust: tough, chewy, and flavorless...not light, flaky, and subtly sweet like a tart crust should be. The tart also never seemed to set and get quite as firm as you would want. It stayed the consistency of a thick pudding, not runny, but too soft to hold its own. And the taste was, well, bittersweet. Like biting into a huge bittersweet chocolate bar with almonds. Blah, boring. Make again? No. Experimenting with semisweet or milk chocolate might be worth another try, but not anytime soon.